Windsor First Aid provides customers the opportunity to register for CPR training which does not encompass any first aid education or certification. These workplace approved courses are specifically made for participants that require only cardiopulmonary resuscitation (CPR) and automated external defibrillator (AED) training. St Mark James has four different levels of CPR training which are defined by an alphabetical letter. CPR level “A”, sometimes referred to as basic life support CPR, is the most basic and shortest of the CPR courses. CPR level “B” can only be obtained through a childcare first aid course and can not be offered in a stand-alone program. CPR level “C” is the most popular and comprehensive course and CPR “HCP” is a course designed for health care workers. We offer each of these courses in our training centres in Windsor. This stand-alone CPR course teaches participants basic CPR rescue skills for adult victims. 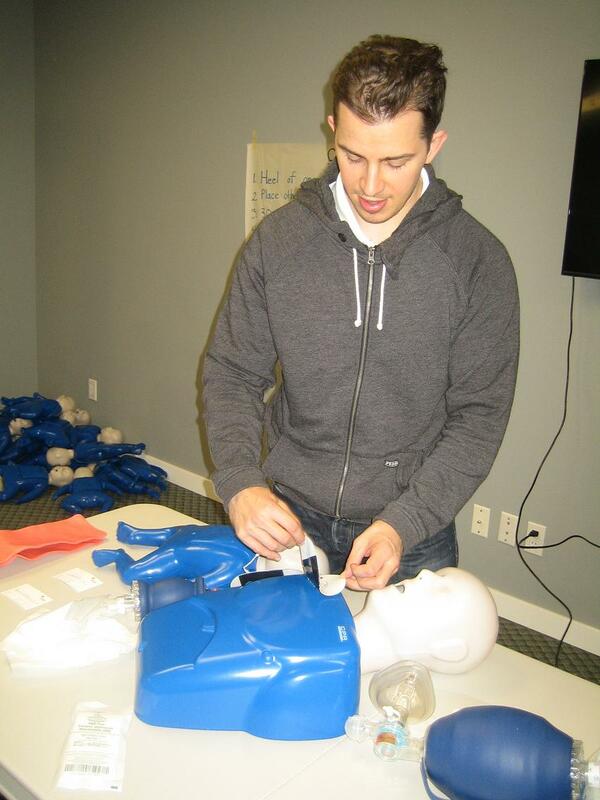 It is a 4 hour course which includes training in the use of AED’s. Candidates will also learn to provide care and attention for patients with breathing emergencies that include choking. Students will also address issues that include contacting emergency medical services and legal significances of doing C-P-R. For more information about the CPR level “A” courses that we offer in Windsor visit our CPR level “A” course page. The most popular and certainly one of the most thorough CPR programs is CPR level C. CPR level “C” encompasses all of the material from level “A” and includes child and infant CPR procedures. The certificate earned through CPR “C” can certainly substitute a CPR – A award. This course takes about 5 hours to complete. To register or for more information visit our CPR “C” course page. The most in depth cardiopulmonary resuscitation training course is health care provider CPR (CPR HCP). This program features all of the content involved in CPR level’s “A” and “C” and comes with further education through complicated tools and trained assistance. This training is marginally lengthier than CPR – C. Common students include healthcare staff, health-related facilitators, and nursing trainees. All of our stand-alone CPR courses include AED training.